It’s funny how when renting a new place, a lot of us painstakingly find the ideal place, immediately pay “to secure the property” then proceed to move in; all this being done before the landlord/agent drops off the tenancy agreement, that’s if there is even a tenancy agreement at all. The role of the lawyer when renting new premises is so underplayed; however, we all know that the Legal fee is a non-negotiable part of the whole transaction. In most instances the lawyer gets to receive awoof money, as the agreement sent out tends to be “copy and paste” in nature. Tenancy in Lagos State is governed by the Lagos State Tenancy Laws, however the majority of the provisions of this act may be contracted out of via the tenancy agreement. Please note that this article was written with yearly tenancies in Lagos State in mind, but some of the issues highlighted are universal. Many of the following terms are so vital, yet they are either not adequately addressed or not even included in the Tenancy Agreement at all. Unfortunately, the moment those terms not included in the document become a cause for quarrel. A sweet relationship can turn sour very quickly. Trust me, beef on one’s doorstep is never advisable. I recently reviewed what I must say is the greatest tenancy agreement I have ever read. The lawyer who drafted it protected the landlord in all ways possible, unfortunately to the detriment of the tenant… my client. And boy did this agreement have A LOT of restrictive covenants and conditions?! Obviously you cannot take away the landlords right to protect himself from nuisance tenants; but in doing so the landlord should at least be fair. When negotiating the eviction clause, try and push for 6 months’ notice as this is what is prescribed under the act. We all know that as a tenant you face the risk of being evicted if you are in arrears with your rent. Unfortunately for some, the moment they are just about settling down in the house they rented, the landlord comes to inform them that the rent has gone up, without caring if the tenant has a fixed budget (which has not gone up). 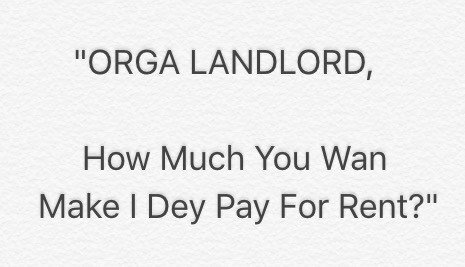 The tenant then cannot afford an increase in rent. Many tenancy agreements do not address rent review, giving the Landlord the power to bully the Tenant. One of my friends got a shocking letter from the landlord telling her that the rent for her shop had increased from 1.1m to 2.2m within the space of 12 months. The guy had seen her activities on social media, and had seen the kind of clientele visiting her shop, he felt “this babe is making money ooh”, and got greedy. As you can imagine, she was not a happy bunny, but had no choice other than to pay up. She had already branded her business location and moving was simply not in her plans for that year. Ideally when renting a place, you should try and negotiate that the rent be fixed for a period of 3 years, after which there may be an upward review of 15-20%. This increase should be communicated to the tenant 3-6 months prior to the end of the tenancy. The service charge is an interesting topic. When I first moved back, I had a little apartment, and I bought my gen which the gate man helped me to operate. After some time the gen developed spiritual problems and my gate man developed shakara. At times, he would switch off his phone when I called him to put on the gen at 3.30am because NPEA has taken light. Honestly, I believed that service apartments were the only way forward, but was seriously advised to be very careful. I must stress that the service charge is entirely contractual and not regulated by law. Unfortunately, in many instances landlords will impose a specified service charge, without actually detailing the services you are being charged for. I am finding increased instances where the concept of service charge is being abused, and landlords using this purely as a means of extracting more money from the tenant. Before paying the service charge insist on a fully itemized breakdown of exactly what the money is to be used for. Where the service charge does not include diesel usage, insist that the landlord provides a monthly estimate of what the likely diesel usage per apartment per month is likely to be. I know the landlord is not a psychic, but where you are not the first ever tenant to live in the apartment, they can use the average monthly usage from the previous year to project the usage for this year. Please note: although not the case in all instances, in MOST instances when accepting the caution fee, the landlord has no intention what so ever of refunding it, upon the termination of the agreement. Again this is another way landlords siphon more money from unsuspecting tenants, and most likely that money is going to be used to “re-pimp” the place for the next tenant. I have not seen a single instance where the tenant vacates premises, leaving it in exactly the same condition as it was in when the tenant moved in. Most landlords do not want to accept that there will always be wear and tear, and where they do accept this, they have now devised this interesting way of hedging against possible losses. In an event where the landlord insists that you pay a deposit, make sure you take pictures of everything before you move in so that you can use this as a reference point in case of a future dispute. A friend of mine rented a very nice property. She was in love with the place, and honestly when I saw it I was too. The house was amazing. Unfortunately for her, the landlady lived in the neighboring compound and that was the beginning of the issues. There was a gap in the fence and my friend would often complain that she would come home from work to find the landlady on her side purportedly “inspecting” the property. She ignored it. Things came to a head when the landlady started dictating the latest time she could open her gate, screaming “Lagos is a dangerous place”. For months my friend found herself tip toeing around the landlady, because she just didn’t want the old woman’s trouble…… eventually she called someone to tastefully seal the gap in the fence and boned. I must stress that the right to peaceful possession is a fundamental right and that without it you don’t have a lease, but a mere licence to occupy space. Once the property has been rented to a tenant, the landlord no longer has the right to re-enter the premises unless he has the tenant’s express permission and upon reasonable notice of same. When moving into a new property always ask the neighbors as many questions as possible. Ask about the landlord’s temperament; ask about the area; investigate why the old tenant moved out. Sha ask as many questions as possible. This is usually a good way of gaging what to reasonably expect from the property. However, I must stress that when renting new premises, even where one has been as diligent as possible, life can always throw curve balls which are totally unexpected for both the tenant and the landlord. In all instances a positive and understanding mind-set will always go a long way. Try to put yourself in the shoes of the other party and act accordingly.